Judi Spiers in conversation with Alan Cotton. Colaton Raleigh based Alan Cotton is one of Britain's most distinguished landscape artists. His efforts however weren't always appreciated. At One time his auntie wanted to throw him out of the house because his paintings were, as she put it, "everywhere." "When's Alan going to grow up and get a real job?" she was often heard to say. "If she could come back now" he told me, "I'd love to take her to one of my shows in London I really would." She would indeed be enormously proud of the young boy who started painting with brushes made from his mother's hair and who at 15 as he puts it, "had the audacity to send work to the Royal Birmingham Society of Artists." He actually sent three paintings and got them accepted. For years as a young art student he had walked down Cork Street, London looking at some of the great exhibitions dreaming of what it would be like to exhibit in the West End. At that time he had found the galleries intimidating and not at all welcoming to young students (tripping water over their carpets and polished wooden floors. Seeing his name emblazoned in red across the window for the first time was as Alan said "the most amazing feeling," admitting that "even twenty years later I still feel the same excited anticipation as I arrive to see the show beautifully hung and lit by the gallery team". 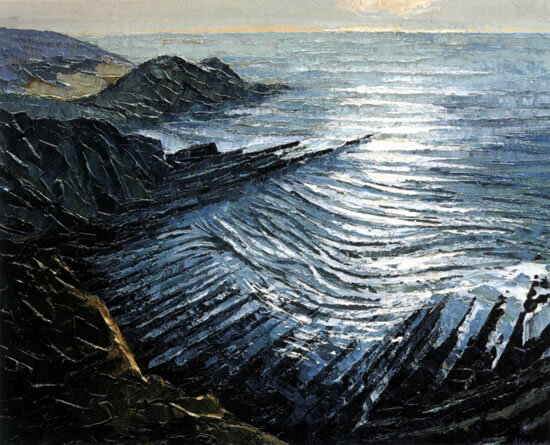 After studying at Birmingham College of Art and then the University of Birmingham Alan came to Devon where he did research at the University of Exeter and went on to become Senior Lecturer in Painting and Art History at Rolle College, Exmouth before giving up teaching to pursue his passion. After meeting and chatting with Alan a couple of times at various events he invited me to a private viewing at his home. Nothing could have prepared me for what I saw. A studio full of stunning paintings of Hartland, the West Coast of Ireland, Tuscany, Morocco and Provence and Venice. I was so knocked out that the mouth decided not to work with the brain and before I could stop myself I blurted out "Ooh I love those gold frames!" Alan's response? He laughed and was generous enough to admit that he too had "lusted" after them when he'd first seen them, only to be told when he tried to purchase some, "Oh no, you can't buy them. These are made for individual paintings and rather special clients." "I was quite deflated," he admitted. "I have never forgotten the exact words he said to me; 'Our man is in Somerset. If you give him a ring, he may care to accommodate you.'" Alan did just that and was deemed worthy of the said frames, and since then Michael Beddoe, Master Frame Maker and Guilder has made all of the frames for his London shows for the last 16 years, and as Alan says "we're great friends." Alan also enjoys a very special friendship with David Messum, his dealer for twenty odd years. I say 'special' because as Alan told me "there is a kind of folk law that there's always a bit of a battle between an artist and his dealer." They first met when Alan was making a film about the Newlyn School of Artists for BBC television. An auction of paintings was in full swing and some of the local dealers had told Alan that a big dealer from London, David Messum, was coming down to bid for the star work - a painting by the Newlyn artist Thomas Cooper Gotch. The cameras were rolling and the painting was on the easel, but still no sign of David Messum. Then as the bidding rose, a silhouette appeared in the doorway, as Alan says, "like John Wayne in an early western." David took up the bidding and clinched the sale. Afterwards, as the highly valued painting rested against the dirty hubcap of a car, Alan interviewed him about his contribution to the revival Of the Newlyn School of Painting. Half way through the interview, as Alan told me, "David suddenly stopped and said ' Hang On a minute, I've just placed you. You're Alan Cotton, painter. What are you doing this lark for?" 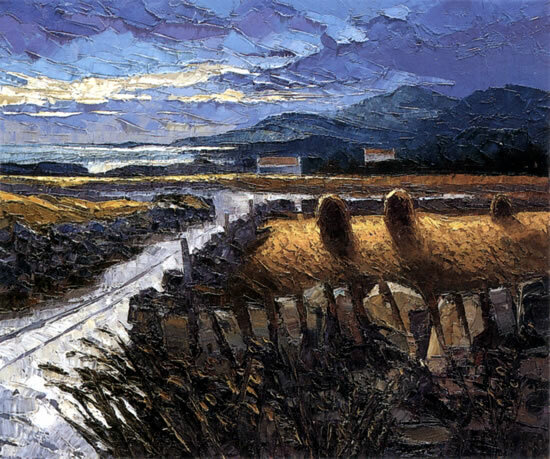 It turned out that he had seen a group of Alan's Hartland paintings, which he very much liked and was about to approach him. They later met at his gallery and David offered to represent him. Nowadays they frequently travel the world together looking for the perfect view to paint. The view that no one else has captured before. One trip David didn't go on though was when Alan accompanied His Royal Highness, the Prince of Wales to Sri Lanka, Australia, New Zealand and Fiji as his Tour Artist in 2005. Despite the fact that official engagements didn't allow much time for Alan to sit and paint with the Prince he was able to see first hand how he interacted with people. "The Prince has the ability to put people at their ease and communicates easily. In Sri Lanka he gave everyone a lift. I am full of admiration for him. He is compassionate and works very hard. His energy levels are phenomenal. I think his role is as a great motivated of people." Alan was also impressed with the work of the Prince's Trust which has had a great impact on local communities and in changing the lives of many young people, and is determined to try to help the organisation carry on its good work. In fact he has proposed an idea for a substantial fund raising project, which is now at the discussion and planning stage. He has also been invited by his friend, the explorer and adventurer David Hempleman-Adams, who is leading an expedition up Everest next April to join him as Expedition Artist. Alan, who has always wanted to paint in high mountains, hopes to get to Advance Base Camp, where there are spectacular views of the North Face and the Himalayan range and tells me he is currently in training! The boy's come good auntie!! "A Private View with Alan Cotton"